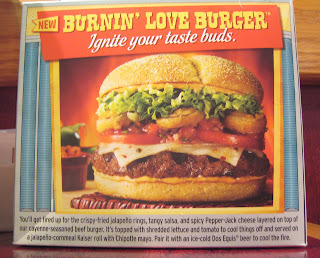 I was at a Red Robin restaurant last week, and on the table was a small advertisement for their new Burnin' Love Burger. I'm not sure I'd want to put anything with the words "burnin' love" into my mouth. Isn't that something that a shot of penicillin usually cures? Yes, it's a funny name, but it's a delicious burger.